1. SkiLink is not about transportation. Modern transportation systems must quickly move the highest number of people possible at the lowest possible cost while minimizing impacts on sensitive natural elements. SkiLink fails. While SkiLink has the potential to move a number of people, it would be at a great cost (both direct and external), and one must consider the realities of SkiLink. What are those realities? 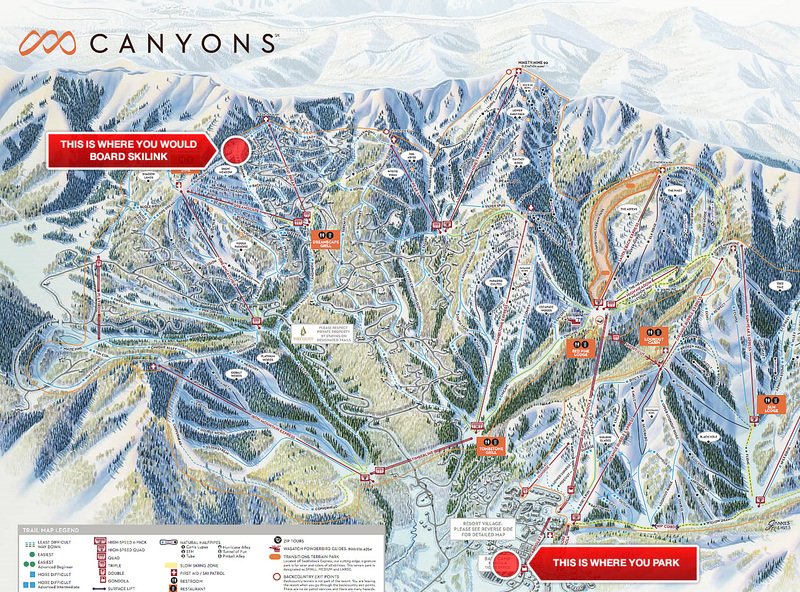 Look at the below picture–it shows where you park at Canyons Resort and where you will board SkiLink. Does this look like a transportation solution between Park City and Big Cottonwood Canyon? Perhaps if you are planning on skiing at Canyons anyway. But who in Park City, planning on skiing in Big Cottonwood Canyon, is going to pay for a Canyons lift ticket ($100+ per person in 2011/2012) and take the 5+ lifts necessary to get to SkiLink (and on to Big Cottonwood Canyon), when it would be significantly cheaper and likely much faster to drive to BCC? Doesn’t it seem more likely that SkiLink is about serving the owners of the multi-million dollar properties in the area (lots alone start north of $1,000,000, with homes ranging from $4,450,000 to $26,200,000), who will have a lift from their subdivision directly to Solitude Mountain Resort and some of the best skiing in North America? I’ve heard more than one person express excitement at the potential of SkiLink turning Park City and Big Cottonwood Canyon into something more like Telluride and Mountain Village. Of course, the Telluride/Mountain Village gondola is public, free, and an actual transportation solution–characteristics that SkiLink does not share. SkiLink is the worst of many possible solutions for those in favor of interconnected resorts. Let’s see… it starts in a private gated community with limited access, costs $96 per person per day to ride it, creates a donut hole of public property surrounded by private land, crosses a historic scenic trail, crosses a designated scenic highway, forces a sale of public lands that weren’t for sale to begin with, promises to attract 75,000 new skiers a year while at the same time reducing traffic and pollution, and is being proposed by a secretive foreign real estate developer with a questionable local environment track record. You can read about some of Andrew’s other ideas here. An informational video about the idiosyncrasies of the SkiLink "Transportation" Proposal put forth by the Canyons Resort and Solitude Mountain Ski Resort. Stop SkiLink, Save The Wasatch, Save Our Canyons! **Note: No Powder was harmed, even touched during the making of this video. Nearly $100 and 1.5 hours later, it is clear that SkiLink is not the transportation solution for Park City residents that it purports to be. Rather, SkiLink is a shady land grab of public lands by a Canadian real estate developer with a questionable environmental track record. It is also an expansion of one Utah ski resort (The Canyons) into one of the ski industry’s true gems (Solitude, which many have pledged to no longer ski if SkiLink becomes a reality). There are many transportation solutions that are much more feasible (and palatable) than selling some of the Wasatch’s prime land to foreign interests. Hike Willow Heights and we think you’ll agree. 2. SkiLink is not smart growth. SkiLink and other interconnect proposals, paving Guardsman, trains, busses, tunnels-—these are some of the many ideas about how to get skiers to/from/between Park City, Big Cottonwood Canyon, and Large Cottonwood Canyon. Some ideas are practical, some are impractical, some are well intentioned, and some are SkiLink. If we are heading down the (perhaps inevitable) road to interconnected ski resorts, we must consider all proposals and select those that: (i) provide true public transportation; (ii) have the greatest likelihood of long term success; and (iii) and that minimize impacts on the Wasatch-–the place from which our drinking water flows and to which we flee to escape the stresses of urban life. SkiLink may be the best solution for a ski resort trying and grow and gain access to hundreds of acres of additional terrain, but it is a poor solution for an economy and public who depend on Wasatch for tourism, recreation, and finding oneself. There are many proposals out there (including those mentioned by Andrew McLean in the article linked to above), and they deserve serious consideration before Talisker acquires 30 prime acres of USFS land. 3. SkiLink sets a dangerous precedent. Utah legislators speak frequently and fervently about the necessity to “take back” public lands, returning them to the people, etc. These are the same legislators who purport to favor a strict and unyielding interpretation of the Constitution, which, by the way, contains the Supremacy Clause. Of course, the Utah Legislature’s own researchers and lawyers told them that H.B. 148 has “a high probability of being declared unconstitutional,” but the legislature went ahead and allocated $3,000,000 of our tax dollars to litigate and try to “get back” land from the federal government. That issue is not directly tied to SkiLink, but the concept is. We have a congressional delegation who again wants to free the federal government of prime land in exchange for money. Money which, once received, will certainly be inefficiently disposed of. While money will quickly disappear, the scar on the Wasatch will remain for generations. SkiLink and the process its supporters have chosen subverts public input and NEPA review, and the heart of the Wasatch deserves a well-planned and public process. What about Utah’s congressional delegation? Our representatives spend much of their careers crying about how the oppressive federal government prevents the state from developing its resources as quickly as possible by putting controlling mandates on local government. Then most of the delegation sponsors a bill that goes against the wishes of the elected governments of Salt Lake City and County to force the U.S. Forest Service to give up 30 acres of public land for an ill-advised ski lift to connect the Canyons and Solitude ski resorts. How do you spell hypocrisy? Most ski resorts are located on USFS land. This means that the ski resort operators own the lift towers, chairs, and other improvements, but the USFS owns the land (which the ski resort operators lease from the USFS). Obtaining a permit to use USFS land for ski resorts involves a number of steps, including public comment/hearing periods. Talisker assumed this process would be much too difficult, so they instead convinced Rep. Bishop, Rep. Chaffetz, and Senators Hatch and Lee to support a bill which will sell a 30 acre strip of land, which land was not otherwise for sale, to Talisker, a Canadian real estate development company with a spotty environmental track record. In other words, Utah’s congressional delegation, minus Matheson, agreed with Talisker that it would be too difficult and time consuming to try to obtain the USFS permit for which Talisker never applied, and rather than hearing any objections from the locals who live near, play in, and drink the water of the area, they found a way to get what they want with a little money and congressional persuasion. The dangerous precedent is this: If a wealthy developer can get the ear of a congressperson (money talks), then the entire regime established to ensure orderly growth within the confines of a system designed to get input from all parties, review potential adverse environmental impacts, etc. can be set aside. Think for a minute about what that would mean. What is to stop someone from getting prime land to throw up a development (which, after all, will bring property tax revenues to the state coffers)? Where does your water come from? Who controls it? (If you live in Salt Lake County, chances are that your drinking water comes from the Wasatch canyons, and even from the very area proposed to be sold to Talisker.) It doesn’t take much of an imagination to see where SkiLink’s precedent could lead. How about roller coasters up and down Mount Superior? Wait-–they’re already working on something like that. 4. Stopping SkiLink is our only chance to save this particular land. Again, SkiLink is a proposal which would sell 30 prime acres to a foreign real estate developer, resulting in development along a corridor at the eastern edge of Willow Heights (the area shown in one of the photographs above (photo curtesy of Christian Paul). Once this land is sold/developed, it is gone and we aren’t getting it back! Those towers will be there until well after we die. 5. Utah’s economy depends on the environment. Now, let’s turn our focus from the narrow issue of SkiLink to a more general discussion of the environment. Utah’s economy depends on travel and tourism. In fact, in 2009, 19.4MM visitors brought more than $6B into Utah, supporting over 110k jobs, and bringing in $625MM in taxes. Do visitors come from all over the world to experience the magnificent inversion? If you are not familiar with the inversion, it is a weeks-to-months-long event in which cold/heavy air gets trapped on the valley floor by a layer of warmer air on top. It feels like a perpetual fog signaling an impending storm–but it is simply a toxic cloud of pollution that blocks the sun and burns the respiratory system. In fact, the pollution in Salt Lake County gets so bad that exercising outside can be as bad for your lungs as smoking a pack of cigarettes. People don’t come here to see a spoiled environment–they come here to explore wide-open spaces, see the sun during the winter (something not generally possible in much of the country), and reconnect with Mother Earth. 6. Protection of the environment is an end in itself; or, what will it look like tomorrow? Have you hiked Donut Falls lately? Years ago, one could find Donut Falls to afford some degree of solitude. Sure, it was heavily traveled and visitors were frequent. But, if hiked today, you’ll find people parking all over trampled vegetation, a number of people with dogs (in the BCC watershed, where they are many, many signs warning that dogs are prohibited), and so busy that some actually turn around before reaching the falls, their attempt at solitude and detachment from the city life frustrated. If you’ve ever hiked an area such as Willow Heights, what a contrast! The narrower, steeper, and more imposing trail thinned the crowds, and even on a busy weekend you’ll enjoy the sort of solitude that compels one to leave the valley for the mountains. Unhindered development, SkiLink, and other issues threaten to destroy areas like this and the beauty that makes Utah unique. There are several ways to protect the Cottonwood Canyons and Utah’s beauty generally. That beauty is worth saving for ourselves, our children, and their children. Fine, but what can I do? Click here for some quick, easy ways to help out!